Landscaping Proposals, Contracts, Estimates, Invoice, Maintenance Checklist, Lawn Care Job Invoice, Landscaping Customer Satisfaction Survey, Landscaping Contracts, Maintenance Agreements, Service Call Forms, Quotes, and more. General purpose, fillable, landscaping Proposal form. About: This proposal comes in two styles, the first displayed in the product image, is the one for use with Microsoft Word, the second, with grass trimming along the form is the Interactive PDF form, for use with free Adobe Reader. Easy to customize with free Adobe Reader using SnappyFORMS's new Forms Options Menu, which allow you to edit the form in a variety of ways not available using standard PDF forms. This detailed project or work proposal allows customers to see exactly what a particular contractor is promising to do (and at what cost). Avoid confusion and provide clear proposals straight from your computer allowing the contractor to manage customer expectations avoiding customer misunderstandings or disputes along the way ensuring smooth job/project transaction from start to finish. 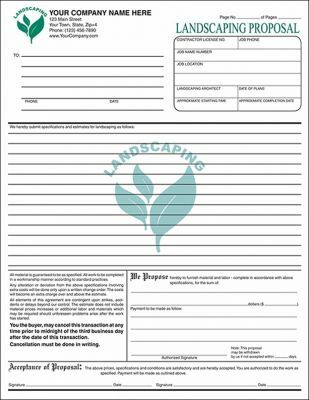 This is a landscaping, lawn maintenance, lawn work Invoice. With our fillable, Word and Interactive PDF forms, you'll never need to spend on printing fees again! 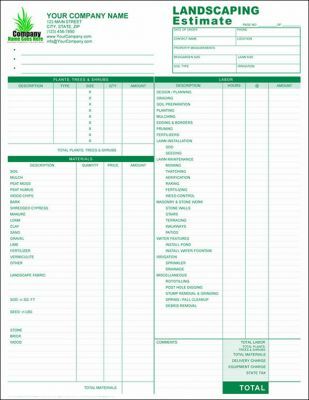 The form contains a check list with general lawn work for easy fill-in with frequency drop down menus (In interactive PDF form only) so that you may quickly choose the frequency of the job, plus space below to add your own list of jobs that you frequently do. Form has space to record customer name, account number, date, account type. Form includes a summary of total charges which include space for an additional charge or credit, sub total and sales tax. Fillable, landscaping proposal helps you get all the details to get the job and avoid misunderstandings with the customer. Area to record customer information, landscaping job details, including starting date and approximate ending date, plenty of room to describe job specifications and estimates, allowing the customer to see clearly what a particular contractor is promising to do, and at what costs. At bottom of form is standard, landscaping industry terms of agreement, or you can add your own clause, form of payment and how payments are promised to be made and signature lines, for both landscaping company and customer. Do away with disputes with signed agreements. 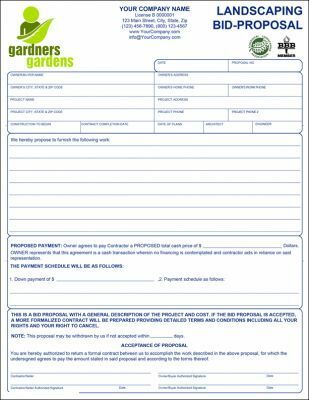 All purpose, fillable, landscaping contractor bid proposal form for all your proposal bidding needs. Proposal includes key points related to the completion of the job, including the time frame for completion, total costs and materials needed to complete the job, proposed payment method, general terms and customer acceptance making write-ups fast and easy. A detailed, specific proposal allowing the customer to see exactly what a particular contractor is promising to do (and at what cost), while also allowing the contractor to manage customer expectations avoiding customer misunderstandings or disputes along the way ensuring smooth job/project transaction from start to finish. 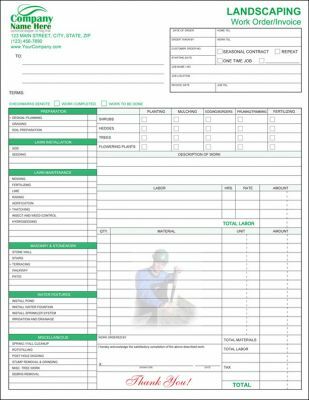 A fillable, landscaping Work Order and Invoicing form and could also be used as an estimating form. Fillable using free Adobe Reader and Microsoft Word. Form covers most landscaping jobs and room for extras. Spaces to record plants, trees, shrubs and flowering plants; materials used; landscaping fabric; lawn materials used; hard materials such as stone, brick, etc. ; labor such as design/planning, planting, seeding installations, and more. 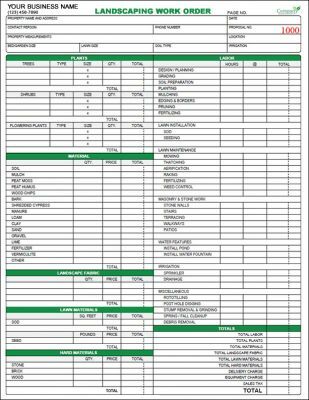 Very detailed work order displaying to customer all work that has been done assures full transparency to customer. while also allowing the contractor to manage customer expectations avoiding customer misunderstandings or disputes along the way ensuring smooth job/project transaction from start to finish. 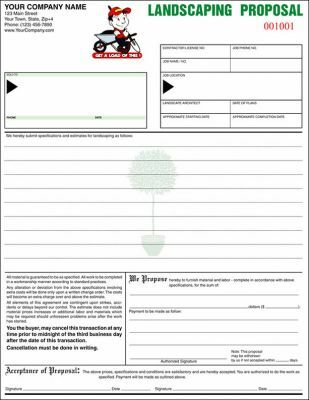 PDF Features: Form is an interactive PDF form and uses SnappyFORMS', Form Option Menu to allow options and features not usually found in other PDF forms. Easily add your company name and contact number, edit total summary text fields, store your state sales tax, form is self calculating, flatten form and send via email and more. This is a 2 page, landscaping and estimating / proposal form. Fillable using free Adobe Reader and Microsoft Word. Form covers just about any type of landscaping job, it has sections to record work on plants, trees shrubs, materials required and labor. Back of form you can use a grid to draw diagrams, attach images, draft a plan, etc. 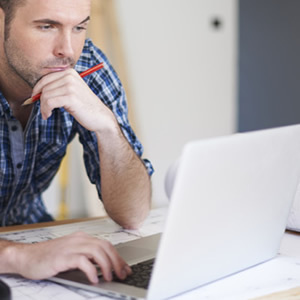 When complete, hand a professionally designed estimate to your prospect. Extremely flexible and easy to use. Form includes key points related to the completion of the job, total costs, materials, equipment and labor needed to complete the job. A detailed, specific estimate / proposal allowing the customer to see exactly what a particular contractor is promising to do (and at what cost), while also allowing the contractor to manage customer expectations avoiding customer misunderstandings or disputes along the way ensuring smooth job/project transaction from start to finish. This is a Landscaping Work Order and may also be used as an Invoice. 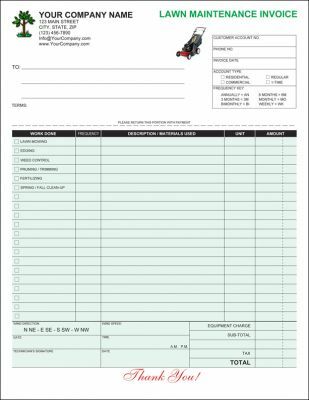 The second page, or backside contains and estimating sheet to add up your job costs and other expenses. Work tasks with check boxes make write-ups fast and easy. The interactive PDF form for use with free Adobe Reader is self-calculating, summing all totals, including the addition of sales tax in your region and the estimating sheet is also self calculating. 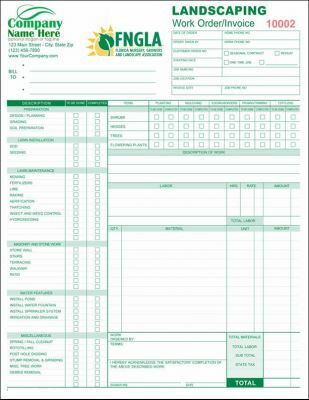 This Landscaping Work Order Form was designed and developed for landscaping companies who need a complete yet easy-to-fill-in form. 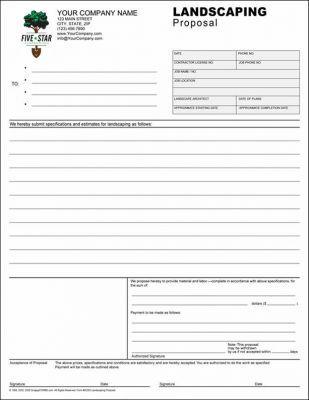 If you are familiar using Microsoft Word or free Adobe Reader, it is very easy to personalize this form to include your company information and logo and use it as a fillable form, from your office or field work. Key components of this form are: an extensive check list of possible landscaping services (landscape design, lawn maintenance, etc. ), a section to briefly write down the customer name and address, lines to indicate the materials for the service performed,a section for job details (date, location, type of contract, etc. ), boxes to indicate charges and totals and a line for your customer to sign acknowledging that the job was completed.